A small group of well-heeled rhino ‘farmers’, each sitting atop his own rhino-horn stockpile, has lobbied the South African government to push for the legalisation of the local and international sale of rhino horn. But the mere talk of legal trade seriously compromises a current, cost-effective, proven and far more durable solution to the rhino crisis; demand reduction, or making rhino-horn use socially unacceptable in Vietnam and China, as it has become in places like Taiwan. By PETER KNIGHTS and ADAM WELZ. Behind South Africa’s rhino-poaching epidemic lies a single, simple thing: the extremely high price some people will pay for rhino horn in Asia. The large amounts of cash handed over in shops and back alleys in Vietnam and China in exchange for small bags of rhino-horn powder, tiny trinkets, necklaces and bracelets – and sometimes whole horns – supports a transnational network of crime that excels at evading controls. The money buys off Asian customs officials, police and airline staff. It pays for the transport costs of middlemen and mules, who risk arrest carrying horn into Asia from Africa. It covers losses when horn is occasionally confiscated en route. It enriches corrupt African politicians and crime bosses who provide weapons, vehicles and operating expenses for crews of poachers, bribes to court officials to make inconvenient evidence disappear and fees for good lawyers and hitmen. It provides an incentive more powerful than the fear of death to the squads of triggermen who regularly enter rhino reserves despite the presence of armed rangers, police and military units. Hundreds have died in shootouts with authorities across the country in recent years, but they still come. The proceeds from a single horn can be literally life-changing in the poor rural communities where many poachers live, where jobs are scarce and nearby parks are hostile no-go zones, not assets that communities can benefit from and be proud of. This means we will never shoot our way out of the poaching nightmare. As spending on armed protection of rhinos has increased, so have South Africa’s poaching rates, now the highest recorded since records began. Massive outlays on harsh security measures by individual reserves can sometimes reduce rhino deaths locally, but the total rhino body-count for the country rises at an ever-greater pace. If escalating the rhino war via more militarised enforcement isn’t the answer, what is? A small group of well-heeled rhino ‘farmers’, each sitting atop his own rhino-horn stockpile, has lobbied the South African government to push for the legalisation of the local and international sale of rhino horn. Although the government says a final decision on legal trade has not been made, it has already promoted the idea internationally. The pro-traders argue that legal sales will generate a windfall from government-held stockpiles of horn and provide an income stream to rhino owners (who can remove horn without killing their rhinos), thus paying for expensive security and incentivising the growth of a rhino-farming industry. Legal marketplaces will replace the black market as the place for Asians to purchase their horn. Because the Chinese have used rhino horn for millennia, they say, there’s no way of persuading them to abandon such a deep-seated tradition. If you can’t beat them, join them. Legal trade is presented as a quick, simple solution to the rhino crisis, but a sober examination of its theory and practice reveals fatal flaws. For example, a robust legal framework for trade would take years to put in place – years our rhino populations don’t have – and not only would trade fail to stem poaching (a fact the rhino farmers admit) but by unlocking consumer demand, trade will likely make poaching worse. Of more immediate concern, the mere talk of legal trade seriously compromises a current, cost-effective, proven and far more durable solution to the rhino crisis; demand reduction, or making rhino-horn use socially unacceptable in Vietnam and China, as it has become in places like Taiwan. 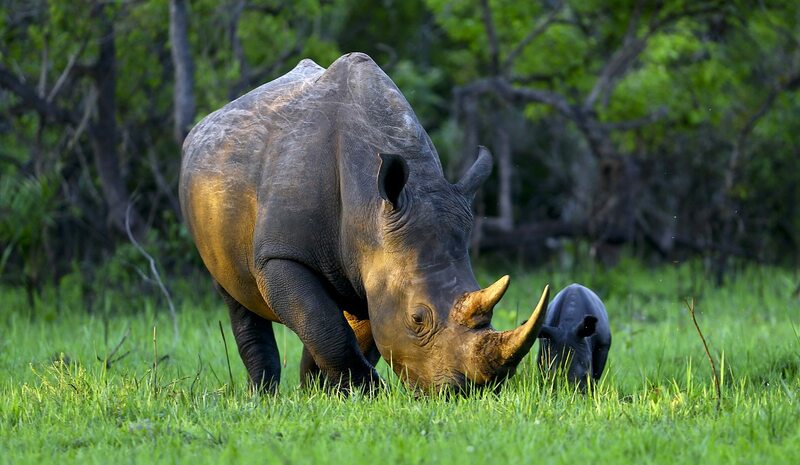 South Africa’s current rhino poaching crisis has a greater and often-overlooked precedent. Between 1970 and 1993, hunters and poachers hit East, West and Central Africa extremely hard. The continent’s black rhino population dropped a mind-boggling 96%, going from about 65,000 animals to just 2,300, the remnant concentrated in southern Africa. That wave of killing and its potential spread south was brought to a rapid halt by domestic sales bans and large-scale public education campaigns in key consumer countries in Asia. Taiwan, with its largely ethnic Chinese population and booming economy, was the largest market for rhino horn in the early 1990s. Horn was widely available in traditional Chinese medicine pharmacies across the island. Criminal gangs were stockpiling horn and driving up its price, spreading rumours to encourage its use and evading law enforcement – much as they are currently doing in such countries as Vietnam. In 1993, under pressure from US trade sanctions, Taiwan enforced a ban on the domestic trade in horn and clamped down on sales of endangered wildlife products in general. Persistent media coverage and public education campaigns ensured that the ban, the medical ineffectiveness of rhino horn and the trade’s links to criminals became widely known. At the same time, mainland China banned the sale and medicinal use of rhino horn and it was removed from the official traditional Chinese medicine pharmacopoeia.In 1994 – just a year later – rhino poaching dropped to very low levels across Africa and the black rhino started to recover in numbers. Demand reduction worked and created a lasting cultural shift in Taiwan, where consumers now shun rhino horn. The rhino poaching problem came back only in the mid-noughties, this time focused on Southern Africa, which by then had by far the largest rhino population in the world. Poachers hit Zimbabwe in the midst of its economic meltdown and so-called ‘pseudo-hunters’ from southeast Asia were allowed to shoot rhino in South Africa under trophy-hunting permits, thus creating a quasi-legal channel to move rhino horn to Vietnam, which has no recent history of rhino-horn use. This allowed criminal syndicates to create a brand-new market there and with it a backdoor to increasingly affluent mainland China. Horn is now promoted for a dizzying and ever-changing array of non-traditional uses including as a cancer cure, hangover remedy, long-life tonic, erectile dysfunction cure and, because of its skyrocketing price, a means of displaying wealth and paying bribes. Demand reduction works best when it’s clear and unambiguous, when rhino-horn consumers hear the same message from their families, social influencers and the government. Organisations working on rhino-horn demand reduction in Asia identify South Africa’s ongoing talk of trade legalisation as the greatest obstacle to persuading governments to enforce their wildlife laws more actively. Officials aren’t motivated to put time and money into cases against horn traffickers if the horn trade may soon become legal. Evidence from similar experiments, such as recent legal elephant-ivory sales, clearly indicates that a legal trade in rhino horn will not replace the illegal trade, but more likely increase it and provide a perfect cover for it. Horn traders will be able to advertise and openly sell horn, which will hugely increase the number of consumers interested in buying. Because governments will have endorsed the sale of horn, consumers will be likely to believe that it is genuinely useful as medicine; users would find it hard to accept that serious institutions like the South African state would willingly be party to fraud. Consumer demand is currently highly suppressed because horn sales are illegal and stigmatised. Extrapolating from the current volume of horn that is poached, probably only a tiny fraction of 1% of the population of China and Vietnam have been seduced by the sales pitches of criminals and buy real rhino horn (another small percentage buys fake horn). If, by legalisation, rhino horn became a government-endorsed product and consumer interest increased to, for example, a mere 1% of these countries population (about 16-million people) and the members of that 1% each bought only 10 grams of rhino horn per year, 150 metric tons of rhino horn would be needed annually. A large male white rhino grows about one kilogram of horn each year (females and juveniles grow less), which means that the full yield of at least 150,000 farmed rhinos would be needed to supply the demand. There are currently around 30,000 rhinos of all species alive on the planet and South Africa’s Department of Environmental Affairs has calculated that, given current population numbers and conditions, our rhinos could realistically supply no more than about four tons of horn a year. If, as seems inevitable, consumer demand rose under conditions of such limited supply – we can’t instantly breed tens of thousands of rhinos – the price of horn would remain high, perpetuating the incentive to poach and locking rhino custodians, such as our government, into paying extremely high security costs indefinitely and/or losing their rhinos. As it does with heroin (morphine), cocaine, tobacco and many other commodities, black markets would thrive in parallel with the legal ‘restricted’ outlets. The legal market would become a laundering channel for poached horn. Once unleashed, the genie of consumer demand would not easily be put back in the bottle. The South African government currently seems powerless to control rhino killing despite huge outside cash influxes for anti-poaching efforts. If it attempts to overturn the international horn-trade ban at the next conference of the parties to the Convention on International Trade in Endangered Species, which meet in Johannesburg next year, it will likely fail, as this will require the votes of two-thirds of the parties present. Delegates will ask how South Africa could conceivably control trade if it clearly can’t control poaching. The world, including China, is moving away from supporting trade in threatened species, and such an attempt would result in international embarrassment on home soil. WildAid is an international non-profit dedicated to ending the illegal wildlife trade in our lifetimes. It focuses on large-scale consumer demand reduction campaigns for threatened wildlife products, which it has successfully rolled out in many Asian markets.